"The city was all mob, thronging, gaping at everything," a man wrote in his diary. It was June 28, 1838. Four hundred thousand people poured into London to celebrate the crowning of Queen Victoria. The young queen herself had gone to bed the night before with a sense of foreboding, "a feeling that something awful was going to happen." Cannons firing yanked her from sleep at four that morning. At ten o'clock trumpets blared. Bands played and the crowd hurrahed. Then the spectators caught sight of the queen. They saw a tiny girl just nineteen years old. She wore a robe of white satin and red velvet, a circlet of diamonds atop her brown hair. The crowd roared. "Long live Queen Victoria!" That storybook coronation did not reflect Victoria's state of mind. A sheltered and uncertain teenager, product of a overprotective mother and an unfaithful and disinterested father, the young queen was hardly prepared for what lay ahead. Her education was perhaps better than that of an average noblewoman of her time but her inexperience made her a potential tool of the warring Tory and Whig politicians and her jealous and grasping relatives. And Britain under her rule was riven with income inequalities, made more difficult by frequent wars to hold onto the empire. "Oh! how I miss all, all!" she cried in a letter to her daughter Vicky. Victoria thought about killing herself, but, as she confided to her oldest daughter, she decided against it: "'A Voice told me for His sake--no! Still Endure.'" And endure she did. In many ways Victoria was one of the earliest of modern women. She deeply loved Albert, but would not make him king, asserting that she herself was the sole monarch. A strict mother and an indulgent grandmother, she was a working woman on the job every day until she reluctantly took to her death bed. That Victoria became the longest-reigning queen of Britain (until her descendant Queen Elizabeth II recently entered her sixty-fourth year on the throne) and that her reign was so seminal in modern history could not have been predicted on her coronation. The granddaughter of George III (that George III, whose purported mad misrule brought on the American Revolution), Victoria was the niece of King William IV, herself the product of the loveless political marriage of George III's last son, Edward, and at birth only fifth in the line of succession. Born in 1819 in the final year of the life of George III, the robust Victoria handily bore nine children between 1840 and 1857 and survived an assassination attempt from a lone shooter and other near-miss attempts. Victoria's against-all-odds reign began by candlelight and ended lighted by electricity in a world with telephones, telegraph, and automobiles, in the apex of the British Empire, and through it all she carried off the responsibilities of the sovereign faithfully through many decades of enormous change, joining the two Elizabeths in presiding over long, historic reigns, keeping the ship of state afloat and delivering it intact into the twentieth century. Of Victoria Regina, all that can be said is What a woman she was! Victoria is now enjoying somewhat of a revival as a media darling. With the BBC Masterpiece series, Victoria, second only to Downton Abbey in viewers, a new movie of her later years currently in wide distribution, Daisy Goodwin's Victoria: A Novel, and the forthcoming Victoria and Albert: A Royal Love Affair , the queen who gave her name to an age is a hot property, and Catherine Reef's forthcoming Victoria: Portrait of a Queen (Houghton Mifflin Clarion, 2017) is sure to be a definitive new biography of that queen. 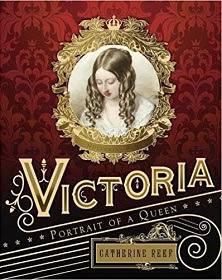 Filled with fascinating facts and deep insights, this biography is lively and highly readable for young adults and just plain adults, one which vividly puts the reader right into both the personal lives and the zeitgeist of the turbulent times Victoria lived. As historical nonfiction, it is bounteously filled with glorious period paintings and portraits, drawings by the queen and her children, and sumptuous illustrations, offering an intimate look at a life (right down to the surprising objects Victoria took to the grave with her) that also shaped our own times. As scholarly nonfiction, it boasts an appendix with a list of Britain's monarchs beginning with Egbert in 802, Queen Victoria's family tree, ample footnotes, picture credits and additional captions, an extensive bibliography, and a detailed index. A first choice for libraries and fans of royalty.